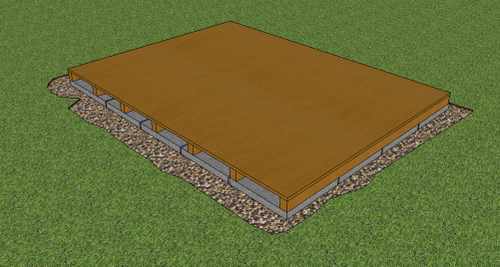 It is possible to build your storage shed foundation by just placing paving slabs or concrete blocks onto well compacted ground. This approach may be successful depending upon site conditions, climate etc. This article describes a method of improving the ground so the foundation can be more durable and give a better long term performance. The sort of foundation described here, where a complete level platform is created would be a good way to build a foundation for a plastic storage shed or any storage shed where the shed floor is of relatively light weight construction. Start by marking out the corners of the storage shed foundation. Use timber pegs made from 2"x2" (50x50mm) timber, sharpened at one end. Knock a nail into the centre of each peg and set up a string-line around the perimeter. Check the rectangular shape that you have marked out by measuring across the diagonal. If the dimensions across each diagonal are equal then the corners are true squares. There are many ways of controlling the level of an excavation, using sighting rails and optical-levels. However, for a small excavation like this it is best to keep it simple a spirit level used together with a long (8' or 2.4m) 4x2 timber will be fine. Using a spade, do an initial strip of the turf (you can use the soil for landscaping elsewhere in the garden). Excavate to the finished depth of 50mm in one corner and then, resting the end of the long 4x2 on this corner peg, measure down to ground level. Cut a piece of timber to this measured length. Continue the excavation, checking at intervals using the 4x2, spirit level and measured length of timber that you are not going too deep. The stone to be used for constructing the storage shed foundations should be what is known as 'well graded material'. This means that there is a good mix of stone sizes from about 40mm diameter down to very fine dust. The best material for this in the UK is sold as Department of Transport Type 1. However for the purposes of constructing a shed, crushed stone, or pulverized concrete should be adequate. 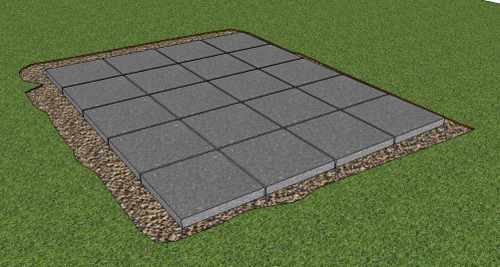 Just make sure that you don't use gravel for a shed base or a single sized aggregate as this will not compact or lock together. This section below through the edge of the storage shed foundation shows a lawn edging to keep the stone separate from the grass (it also makes it easier when it comes to trim the grass). 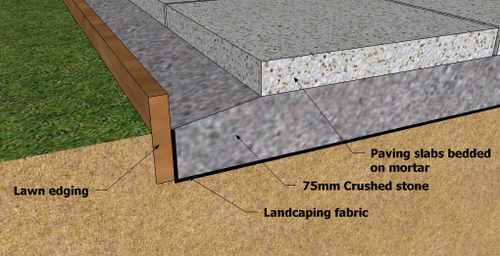 The crushed stone is about 50 mm deep at the lawn edge but thickens to 75 mm after about 150 mm. The thickening helps the foundation to shed water and places the top of the shed foundation about 75 mm above the general ground level. 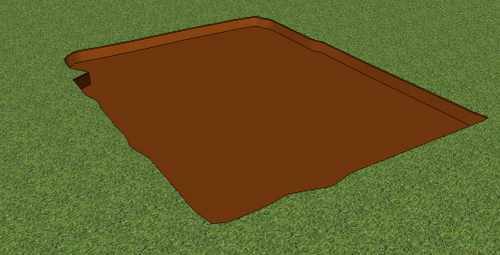 I have shown a landscaping fabric as a separating layer between the ground and the stone. You should make your own decision as to whether this is necessary based on the following information. If the ground on which you are building is firm and dry, leave it out. If the soil is damp and soft, particularly if it is a clay soil, it is a good idea to use it. The purpose of the fabric is to stop the mixing of stone and soil, which over a period of years could lead to a softening of the foundation. For the landscaping fabric use a heavy duty material which is permeable to water (lets water drain away through it). Do not use a PVC damp proof membrane (DPM) at this point as it will only allow water to build up, creating a pond underneath your shed. This would cause damp problems, exactly the opposite of what we are trying to achieve! Before compacting the stone, rake it as level as possible. To compact the stone you could hire a vibrating plate, but if you need a bit of exercise use a hand tamper to compact the ground. Hand tampers comprise a 10kg weight with an area of approx 4''x4'' (100x100mm) which you raise and drop repeatedly to compact the stone. Pound the stone down until it's compacted and even, remembering to keep checking the levels in the same way that you did for the excavation. Add or remove material where necessary to achieve a level platform. On top of the crushed stone place a 1" (50mm) layer of a dry sand/cement mix (This is made up of one part cement to eight parts sand). Spread the mix evenly and rake level. The purpose of this weak mortar mix is to partially fill any surface gaps in the crushed stone layer and prevent loss of sand over time into the stone. Also it should form an even uniform bedding for the paving slabs. Lay the paving slabs starting from one corner. Work outwards from the corner, placing the slabs with a 10 mm gap between them (use wood spacers for this). Level each slab with a spirit level in two directions as you go. Any adjustment to the slab level is best made by tapping the paving slab with a rubber mallett. Keep checking each row as you go with your long 4x2 straight edge, to make sure the base is level in all directions. What you will have created is a sort of utility patio on which to start building the Shed Floor.